Raw dog food sounds scary and outdated so when it comes to our pets, we want to provide the healthy and safest care that we can. We also can’t just feed it dry food for its entire life either! Just as with any other member of our family, their needs are placed high on the scale and that means ensuring they are getting the best diet, exercise, and veterinary care we can find. In turn, they provide us with affection, loyalty, and a connection that often provides more than we can explain in words. But again, it is important to know which foods a dog can and can’t eat. Is Raw Dog Food Safe? A raw dog food diet is most certainly safe, bearing in mind any natural allergies your dog may have. For example, some huskies suffer chicken allergies. This is not a natural allergy, but one that has developed over time due to the contents of many kibble ingredients. While the allergy may be unnaturally based, it is there, thus you would want to avoid feeding raw chicken to the dog. The most dangerous part of a raw dog food diet is bones. No matter what breed you own, you will need to keep in mind the size of the bones in the raw meat you are feeding. For example, if you are adding chicken to your raw food diet, you may want to remove the bones of the chicken if you have a smaller dog. This has nothing to do with the bones being nutritionally harmful, but everything to do with them being a choking hazard for smaller dogs. 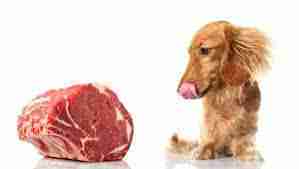 The Controversy of Raw Dog Food: Can Dogs Eat Raw Meat? The answer is yes, of course, they can! In fact, they do so far better than we could. That is because they are natural predators. They are predators who were designed to eat raw meat and much more. One of the biggest mistakes a pet owner can make when owning a dog is only feeding it dry food. Have you ever watched a dog chase another animal and had to call him back to “save” the prey? What would the dog have done had you not heeled them? They would have caught, killed, and eaten that prey. This is natural and perfectly healthy for them. In fact, you’d likely have noticed that their stool was more healthy later that day as well (gross but true). 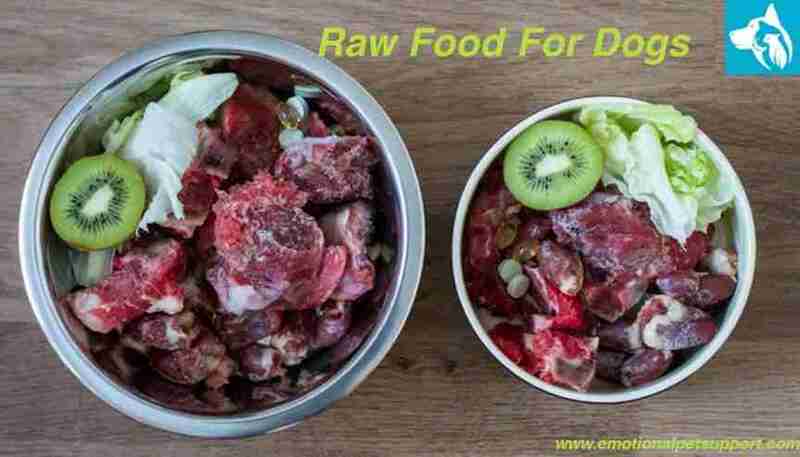 Does a Raw Dog Food Diet Work? Yes, feeding a raw dog food diet works on many levels. From improving digestion to reducing allergy symptoms, the ways this diet can benefit your dog is lengthy. The simple act of switching to a natural diet could be the biggest difference you ever make in your dog’s life. In addition to benefiting their life, it will benefit yours as well, making feeding quick and easy and reducing the veterinary bills that eat away at your pocketbook. As you can see, there are still vegetables and fruit in this diet. However, knowing which ones are safe and which are not is something that requires study, and many owners are left confused about what they find while searching. BARF has taken the confusion out of switching to a healthy, natural diet by doing the research for you and providing exactly what your dog needs. While considering a raw food diet for your dog, you may wonder if humans can switch to this diet as well. Although such a diet does exist in some forms (vegan diets, for example, often consist of many raw vegetables, fruits, and nuts), these diets do not include raw meat, as the human digestive system is not designed to consume raw meat safely. A dog’s digestive tract is much shorter than ours, with far higher acidity, taking risks such as salmonella and E-coli less threatening to their health. Therefore, while it is safe for your dog, it is not a good idea for you to try to switch to a raw meat diet yourself. In fact, we recommend practicing food safety just as you would in any other situation, as salmonella and E-coli are still risks for you when feeding a raw diet to your dog. There is quite a lot of information to be found about feeding raw food to your dog, as well as a litany of questions that may pop up. Below, we have outlined a few of the most common facts that you may have questions about. Q: What ingredients will I find in raw dog food diets? A: Meat, Vegetables, Fruit, Bones, and Organs such as Liver and Kidneys are the staple ingredients of a raw dog food diet. Q: What special food safety do I practice when preparing homemade meals for my dog?A: Proper hand washing, surface cleaning, and utensil sterilization to ensure your safety and your dog’s optimum health when feeding a raw dog food diet. Also be mindful of the inclusion of chicken,pork, and beef, just as you would when making dinner for your family. Q: Are there any allergy concerns I should be watching for when feeding a raw dog food diet? A: It is always important to be aware of pre-existing allergies your dog may have. In addition, keep your eye out for behavior changes, changes in bowel movement or consistency, changes in urination, and other standard health concerns. Any major changes should be reported to your veterinarian, though most dogs that eat a raw dog food diet see the vet far less often than those eating commercial kibble due to the health benefits of the diet. There is a wide range of health benefits for dogs who are switched to a raw dog food diet. The question many owners have is whether or not the benefits are worth the change. If you compare the values from a raw dog food diet to those of kibble, you’ll note that the protein intake is far less in the kibble, while the carbohydrate intake is immensely higher. This is part of the cause of the obesity in family pets, which, much like with humans, involves the ingestion of mass amounts of carbohydrates with less activity. In addition, you will be removing processed foods as a whole, which will greatly improve their health and well-being overall. Primal offers a great range of freeze-dried nuggets for your dog to enjoy. Each style includes all of the healthy ingredients you would expect of a raw dog food diet, including unprocessed, USDA certified meats, organic fruits and vegetables, and no additives and preservatives that could harm your dog’s health. According to DogFoodAdvisor, this is one of the best raw dog foods you can offer to your little furry friend. It is a 5-star rated masterpiece and has a lot of protein! It’s loaded with beef, kale, beef heart, apple, celery, and many other ingredients! If you’re up to the task, then you just might want to consider making your own raw dog food! This isn’t even a difficult task! In fact, it can be as simple as purchasing food from a store! However, if you want to get fancy with it, there are plenty of raw dog food recipes out there for you to try. If you don’t mind putting in a bit of time, you could easily create the meals for an entire month for your dog and freeze them, making feeding time just as easy as it was when you were tossing kibble into a bowl. Note: Be sure to finely chop the vegetables and fruits, as this will help your dog to digest them and take in the nutrients they offer. When preparing the meat, you can cube the meat to make it easier for your dog to consume it based on their size. For example, a husky will have an easy time tearing apart larger chunks of meat, whereas a pug will need much smaller cubes. Can Puppies Eat Raw Food? Yes, puppies can eat raw food. While this may seem odd to some people, it is actually exactly what they would eat if left to their own devices in the wild. Meaty bones, crushed vegetables, and fruits are a natural diet for any stage of growth past weaning. The bones provide the perfect balance of calcium, while also helping to make their jaw stronger. There are a few things to consider when choosing a raw dog food for your pet. After all, we’ve seen how prepared foods for humans can be a touch misleading. Thus, it is most important to check the ingredients listed before choosing a brand. Bad Ingredients. Watch for added sugars, starches, and other processed additions that you’re already trying to get away from. These will not benefit your dog, making the purchase one that you will not want to repeat. Good Ingredients. Make sure there are natural meats, organic vegetables and fruits, and bones included in the ingredients. Be aware of any listing of the word “meal” after an ingredient. This is a common factor in many commercial dog foods which have rendered fats and refined meats that no longer possess the necessary nutrients. How much you feed truly depends on your dog. Just as with kibble, you certainly do not want to overfeed, as overeating is not going to do your dog a bit of good. Keep an eye on their eating habits to help determine what is “full” for them. However, bear in mind that some dogs are simply gluttons and will overeat without thinking. This is when you need to create a portioned schedule for your dog and stick with it to avoid adverse health effects that would be present no matter what diet you feed. 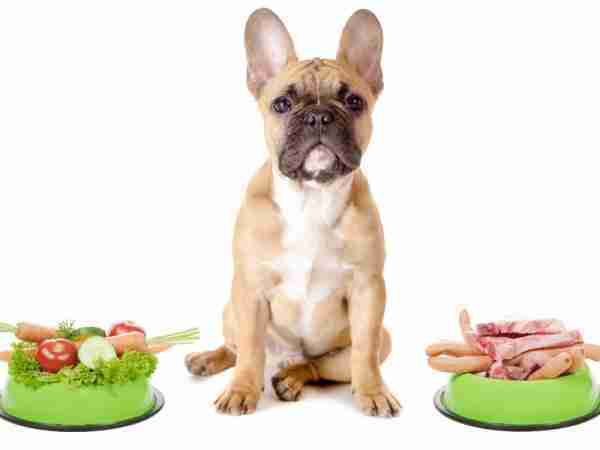 One general rule of thumb for feeding raw dog food diets (for those who prefer a portioned schedule), is to feed 2% of your dog’s natural, healthy body weight. Your dog needs this amount to stay healthy each day and by sticking to this portion you can also help to get an overweight dog back to their optimum weight and health. Thus, if your dog’s natural healthy weight is 100 lbs, you would feed 2 pounds of raw dog food each day. Note: This could be portioned into two meals or four, depending on the feeding schedule you prefer. Natural. Raw dog food diets are the most natural and balanced diet for your dog. Helps allergies. These diets help to reduce allergy symptoms that are often a result of the grain meal in commercial dog kibble. Not as time-consuming as you may think. Feeding a raw dog food diet does not require a lot of processing time, as there are brands available in nugget form for you to feed. Your dog will still be a nice dog. Feeding a raw dog food diet will not turn your family pet into a vicious predator. Many More Benefits! Raw dog food diets help to improve your pet’s coat, digestive health, immune system, and more! It is important to read the reviews of different brands, as well as the diets themselves. Each dog has their own specific preferences as well, which will mean a bit of trial and error while sorting out which vegetables and fruits they prefer. Oftentimes, reviews can help you to determine which raw dog food is best for your specific breed or even just the general age group of your dog. While a raw dog food diet is the best choice for any growth stage, there is a balance of ingredients that change throughout their lives, helping them to remain healthy, happy, and active. No matter which brand you end up choosing for your dog or raw diet recipes you create, you can be sure that you’ll start to notice changes in their health and behavior over time. A raw diet for your dog promotes these transformations, such as the change in their coat, eyes, gums, teeth, and energy levels. Overall, you’ll have the chance to spend a long and happy life with your dog, made better by providing them with the best possible nutrition.